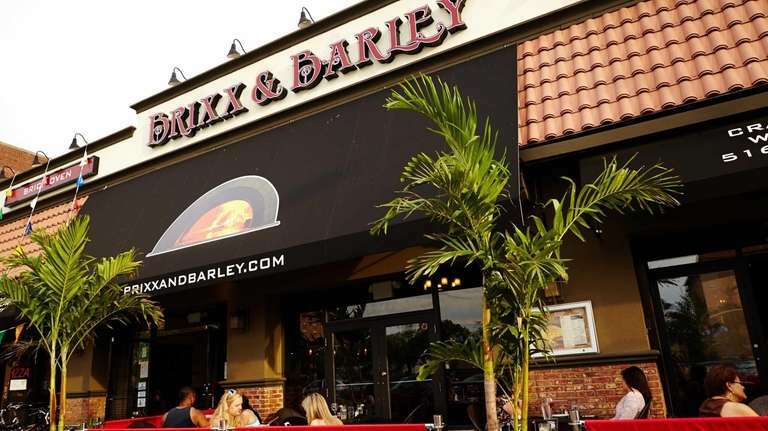 It's a perpetual party at Brixx & Barley, Long Beach's newest gastropub. Their biggest attraction is both their expertly grilled burgers and their long list of craft brews. The festive atmosphere makes this place a fun restaurant to go have a cocktail and a laugh with friends. Monday to Thursday, 11 a.m. to 10 p.m., Friday and Saturday, 11 a.m. to 11 p.m., Sunday, noon to 10 p.m. It can feel like a perpetual party at Brixx & Barley, Long Beach's cavernous and cacophonous (and sometimes chaotic) new gastropub. Chef and co-owner Frank Cammarata, also a partner at Ciao Baby in Commack and Massapequa, traffics in big flavors and big portions -- drawing big crowds. (In the kitchen cooking daily is chef de cuisine Brian Giordano.) Add to that a panoply of craft brews (plus killer sangria), and it's easy to see why the brick and wood space reverberates. Until a planned soundproofing happens, take refuge at a sidewalk table. One temperate afternoon, an outdoor lunch kicks off with deep-dish Sicilian pizza, whose appeal is muted by its lukewarm temperature. At dinner indoors, though, the signature "smashed meatball" pizza proves a huge hit -- piping hot, its thin, crisp crust topped with flattened meatballs, a bright and meaty "Sunday" sauce and fresh mozzarella. Another successful starter: brick-oven-roasted-and-grilled wings tossed with caramelized onions and garlic. They're beautifully charred, imbued with surprising depth of flavor. Grandma's eggplant -- pan-seared and layered with fresh mint and Parmigiana reggiano -- comes out light and lush. But roasted "pazzo" mussels are curiously tired-tasting, crispy duck tacos, way too sweet. The beefy, juicy, expertly grilled burgers are a big attraction here. The Brixx burger is a real firecracker, featuring fried onion wisps, jalapeño and Cheddar. It's plated with fine, hand-cut fries. More of a debauch is the grilled cheeseburger, a grilled patty with bacon, tomato and grilled onions tucked between two thin grilled cheese sandwiches. 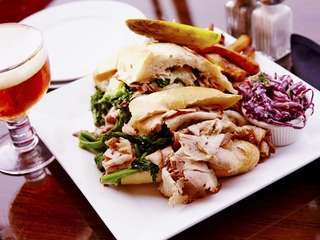 A delectable roasted porchetta hero features tender pork roasted and lightly flecked with orange zest plus broccoli rabe and provolone. Another sandwich star: brisket with red cabbage, spicy Jack cheese, caramelized onion and avocado. A lobster roll turns out to be two commendable little lobster rolls. Nobody's skimping here. Not surprisingly, Cammarata turns out a classically fine bowl of rigatoni Bolognese, the pasta properly al dente, the meat sauce nice and rich. While dessert may not get more typically Long Island than rainbow cookie cake, the light and boozy house-made tiramisu best reflects what this festive newcomer is all about.